Daniel Sturridge does not believe the injury he suffered after scoring against Bayern Munich last night to be serious. Sturridge has suffered persistent injury woes at Anfield over the last 12 months. DANIEL STURRIDGE HAS blamed fatigue for the injury he suffered during Liverpool’s 3-0 Audi Cup win over Bayern Munich last night. The striker scored the visitors’ third at the Allianz Arena late in the second half, racing on to Ben Woodburn’s pass before chipping the ball over Sven Ulreich and into the net, but immediately pulled up in discomfort. 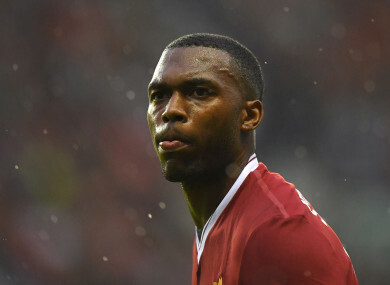 Sturridge, who had only been on the field for 18 minutes before he was taken back off, was later confirmed to have sustained a thigh muscle injury. However, the 27-year-old does not expect it to be anything serious and insists he feels as fit as he has done for some time. “There’s a little bit of tension. We’ve had a lot of training. I think it’s just fatigue to be honest. I’ll be okay,” he told LFC TV. Manager Jurgen Klopp has been impressed with the England international’s application in pre-season and hopes it is only a minor problem. “I can’t say yet,” he told a news conference when asked about the severity of the injury. “He hurt his thigh. He has really prepared well, really well, so I hope this is just a small injury and that he can play again soon. “The goal was great and he had a chance just before that. You could see how fast he is. Sadio Mane and Mohamed Salah were also on the scoresheet as Liverpool romped into the final of the pre-season tournament in Germany, where they will meet Atletico Madrid. Email “Sturridge calms injury concerns after Liverpool striker limped off against Bayern last night”. Feedback on “Sturridge calms injury concerns after Liverpool striker limped off against Bayern last night”.